Posted on 27, September 2016 by EuropaWire PR Editors | This entry was posted in Agriculture, Food & Beverage, Society, Switzerland and tagged Alessandra Ognibene-Lerouvillois, Barry Callebaut, IDH, Jan Gilhuis, Oliver von Hagen, Prova, Sustainable Vanilla Initiative, vanilla farmers in Madagascar. Bookmark the permalink. ZURICH, 27-Sep-2016 — /EuropaWire/ — Barry Callebaut, the world´s leading producer of high-quality chocolate and cocoa, and Prova, one of the world´s premier manufacturers of vanilla extracts and flavors, are joining forces to launch a novel project in Madagascar. The aim is to diversify and stabilize revenues of vanilla farmers through the introduction of cocoa farming. With additional services, the project will also increase levels of vanilla curing at the farm level and support the adoption of Good Agricultural Practices (GAP). The joint project activities will improve the livelihoods of the vanilla farmers located in the district of Bemanevika1. In return, the activities are playing an important role in Barry Callebaut’s and Prova’s efforts to extend the sourcing of sustainable vanilla and cocoa. To accomplish this, Barry Callebaut will apply its long-standing cocoa expertise in association with Prova’s local vanilla know-how, creating synergies on the ground for the benefit of the local vanilla farmers. Both Barry Callebaut and Prova will fund and support local communities through social, health and education programs2. IDH, the Sustainable Trade Initiative, will support Barry Callebaut’s and Prova’s project with professional consulting services as well as financing. The project will run over the next five years. First results regarding the newly introduced cocoa production are expected after three years. With about 80,000 vanilla producers, Madagascar is by far the most important producer of vanilla globally. Although vanilla is referred to as the world’s most popular taste and second most expensive spice in the world, it is also one of the most labor-intensive crops. The vast majority of farmers are smallholders situated in the SAVA region. The rather precarious livelihood of vanilla planters is mainly due to their sole dependency on vanilla and the lack of financial support. Vanilla is harvested and sold from July to December, leading to an income gap of at least 5 months. Cocoa can be harvested throughout the year, helping vanilla farmers to diversify and stabilize their income situation while reducing the dependency on the extremely volatile vanilla market. Through the new project, the involved parties also aim to anticipate future phases with lower vanilla market prices and protect the economic situation of the local vanilla producers. The joint project of Barry Callebaut and Prova aims at promoting crop diversification as a solution to income insecurity by training farmers in the cultivation of cocoa. So far, only a handful of farmers are cultivating cocoa in the SAVA region, but a recent feasibility study conducted by VDB has shown that the Sambava area was suitable for growing cocoa. Although Barry Callebaut does not own cocoa farms, the company has a vast knowledge and is a specialist in cocoa farming. Barry Callebaut will bring this long-standing cocoa expertise into the common project to reinforce farmers’ knowledge on Good Agricultural Practices (GAP) and to grow cocoa not only efficiently but also sustainably. Cocoa grown in Madagascar is certified as “Fine or Flavor Cocoa” by the International Cocoa organization, ICCO. It has particular flavor profiles, which makes it interesting for users of premium cocoa. The price for Madagascar cocoa is higher and more stable than the international cocoa prices. Barry Callebaut uses a significant amount of vanilla extracts and flavors for its different chocolate factories worldwide. 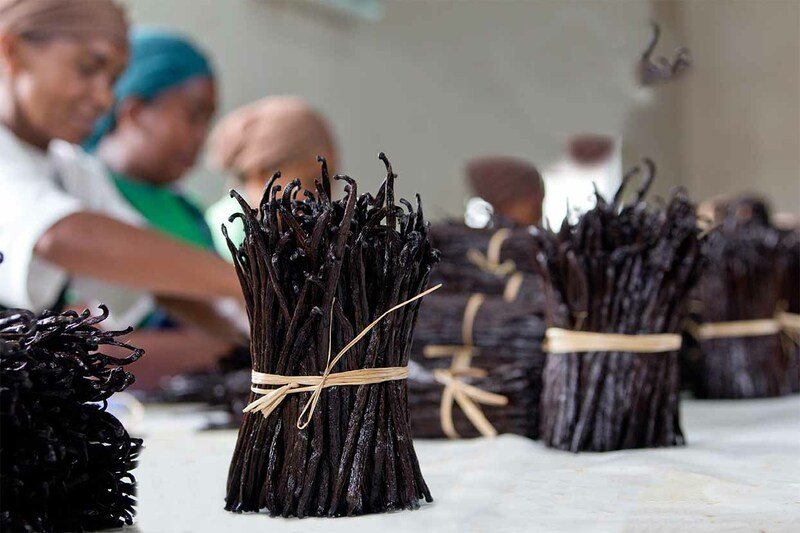 Prova has been a trusted vanilla supplier to Barry Callebaut for many years. Both companies are supporting the Sustainable Vanilla Initiative (SVI), a platform bringing together all the stakeholders of the vanilla sector. Its mission is to promote sustainable production and sourcing in natural vanilla while improving the social and environmental conditions of smallholder farmers, through a combined effort. Vanilla is a key ingredient when making chocolate – next to cocoa, sugar and milk powder. Vanilla is grown in Madagascar, Indonesia, Papua New Guinea, India or Uganda. 1 Located in the SAVA region, the main vanilla growing area in Madagascar. 2 For example: Koba Project, through which an enriched flour known for its nutritional content is supplied to students so they have more energy as well as can concentrate and perform better at school; Mobile Library Project, where Barry Callebaut and Prova reach out to more than 400 children in the community to support their creativity opening up a new world of possibilities. With annual sales of about CHF 6.2 billion (EUR 5.6 billion / USD 6.6 billion) in fiscal year 2014/15, the Zurich-based Barry Callebaut Group is the world’s leading manufacturer of high-quality chocolate and cocoa products – from sourcing and processing cocoa beans to producing the finest chocolates, including chocolate fillings, decorations and compounds. The Group runs more than 50 production facilities worldwide and employs a diverse and dedicated global workforce of more than 9,000 people. The Barry Callebaut Group serves the entire food industry, from industrial food manufacturers to artisanal and professional users of chocolate, such as chocolatiers, pastry chefs, bakers, hotels, restaurants or caterers. The two global brands catering to the specific needs of these Gourmet customers are Callebaut® and Cacao Barry®.The Barry Callebaut Group is committed to sustainable cocoa production to help ensure future supplies of cocoa and improve farmer livelihoods. It supports the Cocoa Horizons Foundation in its goal to shape a sustainable cocoa and chocolate future. Worldwide leader in conceiving and manufacturing vanilla, cocoa, coffee and sweet brown extracts and flavours for the sweet food industry, PROVA is present in more than 60 countries across five continents. Thanks to the meticulous and respectful selection of raw materials and innovative extraction methods, the company always delivers high quality flavours specifically tailored to meet consumption trends and local taste preferences of each country. PROVA was created in 1946 and remains an independent family-owned business. Its headquarters are located in Montreuil, near Paris in France.